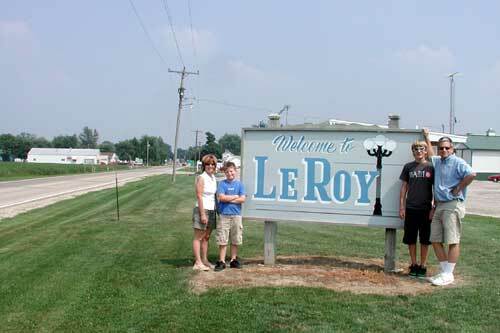 Tuesday it was out to visit the nearby farm town of LeRoy, Kristi's home growing up. Of course we go by and visit the places of Kristi's youth: her house where she lived until she was 7, the farm house the family moved to, her schools, the community swimming pool, grandma's house. Nothing stays the same, of course: the Dairy Queen where she had her first summer job is gone, they were busy tearing down the high school after building a replacement, and, worst of all, they put in a new LeRoy sign on the other side of town by the freeway off ramp. This is our traditional favorite sign, however, with the inexplicable lamp post. Better a grain elevator. One of the things we did out on the empty black top between hamlets surrounded by nothing but corn was to let Brad drive because, as Kristi said, by the time you're 13 on an Illinois' farm, everybody's driven a car. Brad got it all the way up to 35 MPH, kept it in his lane, and, as Mom observed, was far too good at it for a first time. 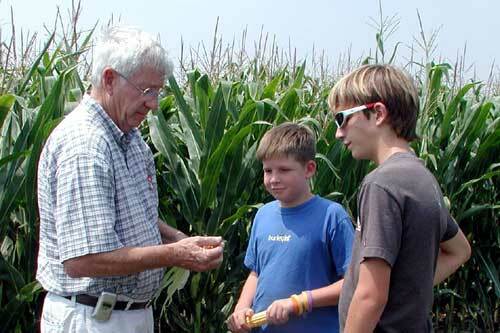 While we were out amongst the corn fields, Bob taught the boys (and Keith, who listened in) a thing or two about corn, and how to farm it. They were all ears. On Wednesday, it was off to the McLean County Fair, billed as the world's largest 4-H fair. 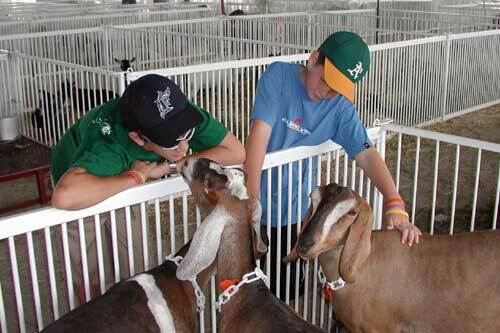 Being a 4-H fair meant everything was for and by kids: livestock to exhibits. This is as opposed to the San Diego fair which is very adult oriented, from livestock to woodworking to beer making to sales pavilions. This fair was on a much smaller scale, but better for it. The children's arts and crafts and culinary arts (cooking!) competitions were much larger than San Diego. Over at the livestock, Brad misses Dancer so much he'll kiss a friendly goat instead. 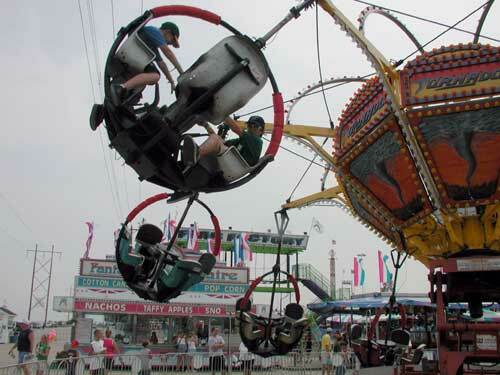 The McLean County Fair may have been a bit smaller and quite a bit less jaded than the San Diego County fair, but it still boiled down to the same two things for the boys: the food and the rides. And the carnies were just as jaded as the ones on the California fair circuit. The boys dressed perfectly appropriately for the San Diego Fair: baseball team caps, surf logo T-shirts, and shorts. We couldn't help but notice, however, that they were woefully out of step with the local youth fashion of feed caps, school athletic T-shirts, and working jeans (even though it was so hot). 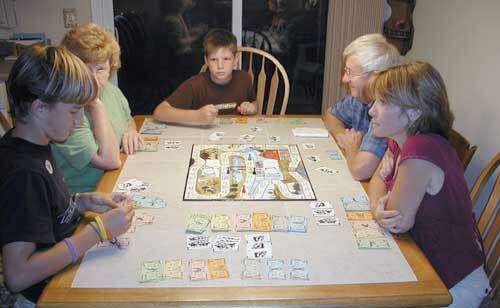 We held the traditional intergenerational game of Life on the Farm, created by a Minnesota cattle farmer. If the boys can't grow up on a farm like their mother, at least they can play like it. It's funny how everyone starts talkin' with a thick midwesterner farm accent. Well, everyone but Papa, who talks like that normally. The other tradition about the game is that Kristi looses horribly. While everyone else is building up their herds (you win by getting 60 head of cattle), Kristi always kills hers off ("Cow hit by car" or "Hunter mistakes your cow for deer" or "Cow wanders into swamp"). She's a very good sport to play every year although we all laugh mercilessly at her bad luck. Friday Kristi and her mom went out for a day of shopping, just the girls together, leaving the menfolk to fend for themselves. 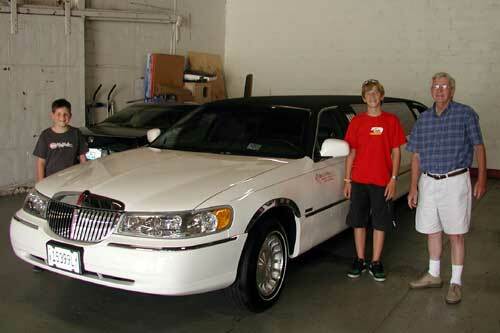 Papa took us by the garage for the limo company he works for as a chauffeur. He likes driving, and in addition to this job, he takes jobs moving cars between cities for car dealerships and driving a hearse for a mortuary. Given choices, I guess we were lucky he took us to the limousine garage for a tour. Oops! Papa puts it in the drink! 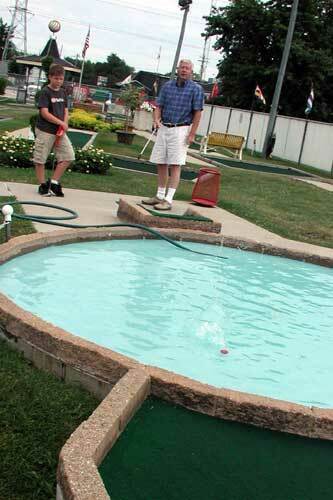 With the girls out and Papa and Keith left to entertain the boys, we resorted to the old standby, miniature golf. The boys thus got their second round of golf during the vacation. 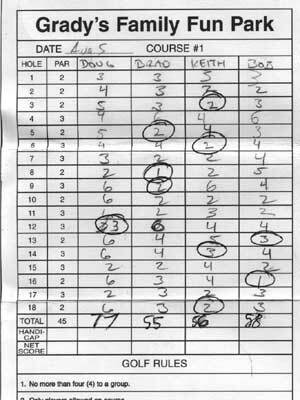 ....Until Keith counted up the strokes and found Brad had beaten him by a stroke, but that he had beaten Brad 4 holes to 3. Henceforth, all golf games will be scored this new way (i.e. which ever way Dad wins). Keith can abide by many things, including Brad walloping him on any run over 100 yards. But being beaten on the miniature golf course was indeed a bitter pill to swallow. 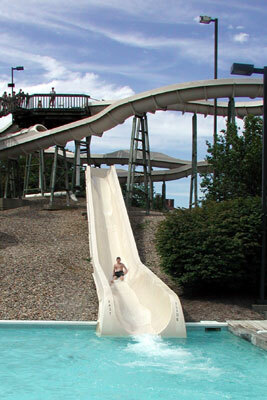 That afternoon, Keith took the boys to the city water park. This is also fast becoming a tradition whenever we visit the grandparents in the summer. It is a great facility run by the city of Normal with two big water slides (that's Doug nearing the end of the fastest water slide), two drop slides, a diving board, lots of pool, and three sand volleyball courts. All in all a great bargain for only $4, even if it is overrun by too many unruly YMCA day campers and not enough harried Y counselors. We even found a couple of boys to play volleyball with. We had some pretty good rallies with Brad and Doug against the two boys, and Keith ducking back and forth under the net mid-rally, playing setter for whoever had the ball. Friday evening, our last in Illinois, we squeezed in yet another tradition: pork tenderloin sandwiches at the old Wishing Well. The restaurant is actually called Schooners, and has been since Kristi first took Keith to Bloomington (1988). But for some reason it is always referred to by its previous name. The pork tenderloins come out on a pizza tin; when you order they ask you how many buns you want.